A U.S. Coast Guard received a call around 10:15 a.m. from a crewmember aboard a lobster boat requesting aid. A 41-year-old lobsterman had been impaled with knife around 130 miles east of Cape Cod. The man ended up being rescued by helicopter and taken to the hospital. 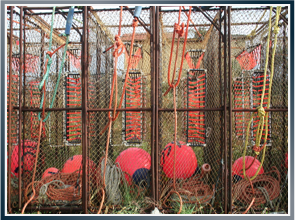 Employers and lobster boat operators have a responsibility to provide a safe working environment, in spite of all the challenges in the fishing industry. They must require all crewmembers to wear personal flotation devices (PFDs), work to decrease the likelihood of gear entanglement, train the crew, identify and implement effective recovery methods should a lobsterman fall overboard. If your employer fails to do so and you suffer an injury as a result, contact a maritime attorney immediately who can explain your rights and work to ensure you have what you need to recover. As maritime attorney Carolyn Latti explains, we offer free consultations. Latti & Anderson LLP is a maritime injury law firm that fights for workers injured at sea. Previous Did you know Lindsay Lohan’s Finger Amputation is One of the Top Types of Boating Accident Injuries?